Changing tires to a new size or changing rear-end gears can have an impact on speedometer accuracy. This is because your speedometer is controlled by two small gears that are optimized for a particular combination of tire size, rear-end gear ratio, and transmission type. The drive gear is attached to the transmission output shaft inside the tail shaft. 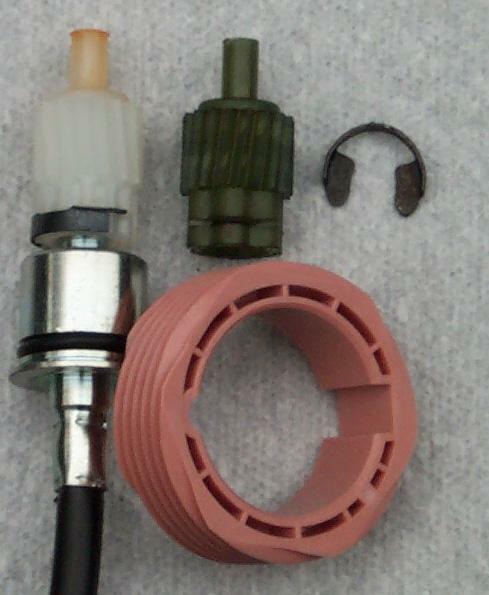 The driven gear is attached to the end of the speedometer cable that is inserted into the side of your transmission. The two gears are available in a variety of helix (spiral direction) and "number of teeth" configurations to produce reasonably accurate speedometer readings given the different tire, gear, and transmission combinations. OEM speedometers are generally NOT completely accurate. The idea is to come up with the drive-driven gear combination that produces the smallest margin of error within acceptable tolerances. That's where this calculator comes in! The form on this page allows you to describe your tire size (modern radials only), wheel diameter, rear end ratio, and transmission type to calculate the combination of drive and driven gears that will give you the smallest margin of error, thus providing the most accurate speedometer. Part reference information is taken from the 1975 Ford Master Parts Catalog, so it can be considered accurate for Ford parts used up to that point in time. You may need to do your own homework to come up with current part numbers. Please note that this calculator does NOT do extensive error checking of the input values you provide. Garbage in, garbage out, so please check your numbers carefully if you want to see meaningful results. Finally, note that the values used by the calculator are specific to 1968-1970 Ford Mustangs equipped with a 428 cubic inch engine. The algorithms it uses can be adapted to other applications, but the part references (including gear teeth counts) are specific to CJ and SCJ Mustangs. In theory you should be able to use these gear combinations without a speedometer gear adapter, but that wouldn't explain why Ford used an adapter in the first place. More research is clearly needed. Original gears can be identified by tooth count and color. Left helix gears as used in 4-speed manual transmissions are made of whitish nylon with a color-coded tip. Right helix gears as used in automatic and 3-speed manual transmissions are made of colored nylon. Drive gears are also made of colored nylon. I believe that reproductions of the driven gears are only available in black. Here's a picture of all three types. A 16-tooth, left helix driven gear with orange tip is on the left. A 17-tooth, right helix driven gear in green is on the right. A 6-tooth, pink drive gear is in the middle. On to the calculator. Just enter the data as described below and hit "Calculate". Only mark "Yes" with 3.91 or 4.30 rear end ratios.